^ Truedsell, Leon E. (1965). The Development of Punch Card Tabulation in the Bureau of the Census 1890-1940. US GPO. p. 51. ^ Truesdell, Leon E. (1965). The Development of Punch Card Tabulation in the Bureau of the Census 1890-1940. US GPO. ^ Report of the Railway Accounting Officers. 77. Association of American Railroads: Accounting Division. (1888). p. 107. ^ Krajewski, Markus (2011). Paper Machines: About Cards & Catalogs, 1548-1929. MIT Press. ISBN 978-0-262-01589-9. ^ IBM (1957). Machine Functions. 224-8208-3. http://www.bitsavers.org/pdf/ibm/punchedCard/Training/224-8208-3_Machine_Functions_Mar61.pdf. ^ IBM (1959). Flow Charting and Block Diagramming Techniques. /C20-8008-0. http://www.bitsavers.org/pdf/ibm/generalInfo/C20-8008-0_Flowcharting_Ref_Man_Sep59.pdf. ^ IBM (1949). The How and Why of IBM Mark Sensing. 52-5862-0. ^ IBM (1958). IBM 063 Card-Controlled Tape Punch. 224-5997-3. http://www.bitsavers.org/pdf/ibm/punchedCard/CardControlledTapePunch/224-5997-3_63_Card_Controlled_Tape_Punch_1958.pdf. ^ IBM (1963). IBM Accounting Machine: 402, 403 and 419 Principles of Operation. 224-1614-13. http://www.bitsavers.org/pdf/ibm/punchedCard/AccountingMachine/224-1614-13_402-403-419.pdf. ^ IBM (1956). IBM Reference Manual: Functional Wiring Principles. 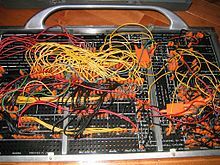 22-6275-0. http://www.bitsavers.org/pdf/ibm/punchedCard/Training/22-6275-0_Functional_Wiring_Principles.pdf. ^ Pugh, Emerson W. (1995). Building IBM: Shaping an Industry and Its Technology. MIT. p. 67. ISBN 0-262-16147-8. ^ a b Pugh, Emerson W. (1995). Building IBM - Shaping an Industry and Its Technology. p. 50. ISBN 978-0-262-16147-3. ^ Phelps, B.E. (July 1980). “Early Computers at IBM”. Annals of the History of Computing (IEEE Computer Society) 2 (3): 254. ^ (Bashe 1986, pp. 465–494) Chapter 12 Broadening the Base, a history of IBM's 1401 and 1403 development. Aspray (ed. ), William (1990). Computing before Computers. Iowa State University Press. pp. 266. ISBN 0-8138-0047-1. Bashe, Charles J.; Johnson, Lyle R; Palmer, John H.; Pugh, Emerson W. (1986). IBM's Early Computers. MIT. ISBN 0-262-02225-7. Brennan, Jean Ford (1971). The IBM Watson Laboratory at Columbia University: A History. IBM. pp. 68. Cortada, James W. (1983). An Annotated Bibliography on the History of Data Processing. Greenwood. pp. 215. ISBN 0-313-24001-9. Cortada, James W. (1993). Before the Computer: IBM, NCR, Burroughs, & Remington Rand & the Industry they created, 1865 - 1956. Princeton. pp. 344. ISBN 0-691-04807-X. Kistermann, F.W. (Summer 1995). “The way to the first automatic sequence-controlled calculator: the 1935 DEHOMAG D 11 tabulator”. Annals of the History of Computing 17 (2): 33–49. doi:10.1109/85.380270. Krawitz, Miss Eleanor (November 1949). “Watson Scientific Computing Laboratory: A Center for Scientific Research Using Calculating Machines”. Columbia Engineering Quarterly. http://www.columbia.edu/cu/computinghistory/krawitz/index.html. Lars, Heide (2009). 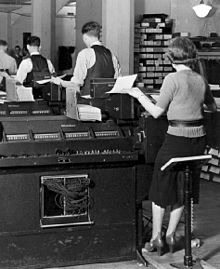 Punched-Card Systems and the Early Information Explosion, 1880--1945. Johns Hopkins U Press. pp. 369. ISBN 0-8018-9143-4. Pugh, Emerson W.; Heide, Lars. IEEE STARS: Punched Card Equipment. IEEE. http://ieeeghn.org/wiki/index.php/STARS:Punched_Card_Equipment. A very readable, accurate, summary. Austrian, Geoffrey D. (1982). Herman Hollerith: The Forgotten Giant of Information Processing. Columbia University Press. pp. 418. ISBN 0-231-05146-8. Hollerith, Herman (December 1894). “The Electric Tabulating Machine”. Journal of the Royal Statistical Association (Blackwell Publishing) 57 (4): 678–682. doi:10.2307/2979610. JSTOR 2979610. Truedsell, Leon E. (1965). The Development of Punch Card Tabulation in the Bureau of the Census 1890-1940. US GPO. Baehne (editor), G.W. (1935). Practical Applications of the Punched Card Method in Colleges and Universities. Columbia University. pp. 442. http://www.columbia.edu/cu/computinghistory/baehne.html. Ferris, Lorna; et al. (1948). Bibliography on the Uses of Punched Cards. MIT. IBM (1944). IBM Accounting Course. 25-4933-3-3M-ME-1-49. http://www.bitsavers.org/pdf/ibm/punchedCard/Training/IBM_Accounting_Course_1949.pdf. Eckert, W.J. (1940). Punched Card Methods in Scientific Computation. Columbia University. pp. 136. ISBN 0-262-05030-7. Note: ISBN is for a reprint ed. Bureau of Naval Personnel (1971). Basic Data Processing. Dover. pp. 315. ISBN 0-486-20229-1. http://www.bitsavers.org/pdf/ibm/punchedCard/Training/Basic_Data_Processing_1970.pdf. Fierheller, George A. (2006). Do not fold, spindle or mutilate: the "hole" story of punched cards. Stewart Pub.. ISBN 1-894183-86-X. http://www.gfierheller.ca/books/pdf/do_not_fold.pdf. IBM. An Introduction to IBM Punched Card Data Processing. F20-0074. http://www.bitsavers.org/pdf/ibm/punchedCard/Training/F20-0074_An_Introduction_to_IBM_Punched_Card_Data_Processing.pdf. IBM (1957). Machine Functions. 224-8208-3. http://www.bitsavers.org/pdf/ibm/punchedCard/Training/224-8208-3_Machine_Functions_Mar61.pdf. IBM (1959). IBM Operators Guide: Reference Manual. A24-1010-0. http://www.bitsavers.org/pdf/ibm/punchedCard/Training/A24-1010-0_IBM_Operators_Reference.pdf. IBM (1957). IBM Equipment Summary. http://www.bitsavers.org/pdf/ibm/punchedCard/Training/Card_Equipment_Summary_Aug57.pdf. Murray, Francis J. (1961). Mathematical Machines Volume 1: Digital Computers. Columbia University Press.